UDM Downloads > PIE Picture Information Extractor! 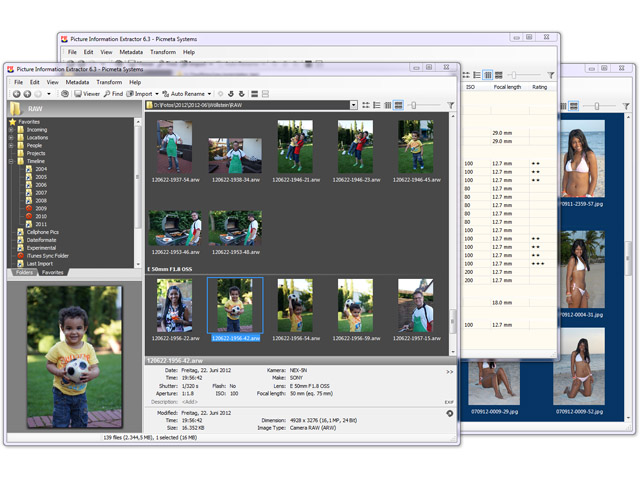 Deluxe viewer and photo metadata toolkit for amateur photographers and professionals alike. PIE is a free image browser and viewer with perfectly integrated photo metadata and file renaming features. It extracts EXIF, XMP and IPTC information from JPG, TIFF and RAW files and makes it available in a convenient and welcoming interface. One part of the metadata is standardized and contains information such as date and time the picture was taken, shutter speed and aperture etc. But a lot of information such as program mode, white balance settings or lens data, is stored in the Makernote block, which is proprietary and can usually only be read with special software from the camera maker. PIE, however, contains the most extensive Makernote database on the market. Feature Highlights: * Edit EXIF and IPTC metadata, add or delete tags, change date picture taken, lossless rotate and update embedded thumbnails, in single file and batch mode * Geotagging of photos with interactive map * Automatically rename picture files keyed to the date and time as well as other photo information * Quick batch change of capture date/time, works with JPG and RAW formats. * Allows to remove EXIF, IPTC and/or XMP headers from JPG-files. * Very comfortable picture file manager. Move, copy, delete and rename picture files. * Fast integrated picture viewer, naturally with image preloading, zooming and panning, as well as slide show features. * Best way to download from memory card to your computer. It automatically creates a folder structure, moves or copies photos and videos, renames them as defined in the filename mask, and rotates photos taken in portrait mode. * Support for PTP/MTP transfer, iPhone, iPad Support for Sony .ARW .SR2, Canon .CRW .CR2, Adobe .DNG, Epson .ERF, Kodak .DCR .KDC, Mamiya .MEF, Minolta .MRW, Nikon .NEF, Olympus .ORF, Pentax .PEF, Fuji .RAF, Generic .RAW. The free version does not save metadata, but is otherwise fully functional.